Tasty treats your pet will absolutely LOVE! Get the best of both world’s – snacks your pets will crave and the peace of mind knowing you r feeding them something that is healthy, organic, and 100% made in the USA. 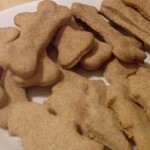 Our gourmet organic pet treats are made with real human grade, all-natural and 100% ingredients. Also, we do NOT use wheat gluten either, as all treats are made from whole-wheat flour. Each treat is an excellent source of protein and fiber for your pet.